For the next three days, we’ll provide evening Shot Shot Reports with many large photos and video clips. Topic Highlights of the SHOT reports will be posted here in the Bulletin. 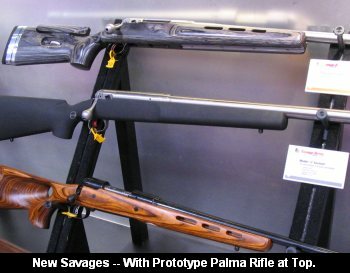 Savage Displays New Palma Rifle with Deluxe Metal Adjustment Hardware. Battenfeld Technologies Unveils $220.00 Co-Axial “Fire Control” Front Rest. Anschutz Will Continue to Produce Series 2000 Action. Dieter Anschutz Announces Retirement. Lapua Debuts X-ACT Ultra-Premium Rimfire Ammo. Is this the Most Accurate Rimfire Ammo Ever? Dave Kiff Displays new PT&G Products. Offers Discounts to 6mmBR.com Readers. 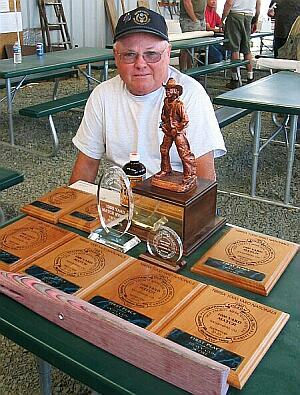 Share the post "Daily Reports from Shot Show"
Based on his recorded scores, it’s believed Jerry set all these records on Saturday: 3 Grand Senior records; 1 Senior record; 1 Civilian Record; and 1 Open Record (best regardless of age group or military/civilian status). The 6mmAR is a wildcat based on the 6.5 Grendel case necked down to 6mm. It provides performance very similar to that of the 6mmBR Norma with a cartridge that will mag-feed in an AR style rifle. Robert Whitley has done extensive development for this round, developing optimal loads he’s posted on www.6mmAR.com. Robert also sells “space gun” accessories, and complete 6mmAR upper assemblies. Share the post "Tierney Sets High Power Records"